We will respond as soon as possible. The pictures do not always reflect the. Size: 33 / 30. Waist: 33”. Inseam: 30". TALON 42 ZIPPER. UNION MADE IN THE USA. FRONT RISE-12 1/2. You will get everything you see in the pictures. Although they are oversized, when they are belted and rolled they look fabulous. The jeans are incredibly soft from age and wear and the paint colors are in shades of soft white, blues and greens and are beautifully distributed, primarily on the front with a little in the back. Condition: Naturally worn-in and distressed with fading at edges and seams. Strong whiskers across the top of the legs. Heavy fading under front pockets. Faded down the front of the legs to the knees with the very lightest yellow staining. 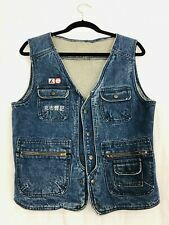 Vintage Levi 501 Jeans Blue Button Fly W 33 L 32 (LBJ-10). Condition used with some staining and little fraying on cuffs.Shipped with USPS Priority Mail. Our goal is to send zero waste to landfills, of the thousands of textiles & goods that people throw away every year, as much. as 95% could be re-worn or recycled or re-used. Total length: 45". We do our best to show accurate color although colors may be slightly different from our computer to yours. Thigh 24" (12" Crotch to outer Thigh). Inseam: 32". Ankle 18" (9" Across X 2). front Rise: 13". Very Good Pre-owned condition, no issues of any kind. Has a 4” year on back of left leg. looks like original owner cuffed the jeans but they hit the ground when walking. I have two pairs of these size. 31” inseam. 40.5” waist. Nice distress and slight soiled look. no noticeable holes or tears. paper back patch still in tact. good lookin! #554 waist button. Marked W 32 L 34. 32” inseam. 43” top to bottom. Watch pocket. Label on back hip has serial number: 0223. 31” inseam. For your consideration. Material: Acid wash Cotton. Waist: 15". Inseam: 33". VERY GOOD CONDITION! RARE AND HARD TO FIND! MADE IN THE USA! NORMAL WEAR ON THE HEMS SEE PICTURES #4 & #5. THE JEANS YOU SEE IS THE JEANS YOU WILL RECEIVE. Likely 100% cotton or a cotton blend. standard 5 pocket design. I've just received a huge lot of clothes, 21 large bags - in a wide variety of sizes. I do my best to list any major flaws that I notice. IF THESE WERE MY SIZE THEY WOULDN'T BE FOR SALE. SMALL HOLE IN LEFT LEG PICTURES #7 & #8. THE PANTS YOU SEE IS THE PANTS YOU WILL RECEIVE. Original Vintage 1980s 80s Men's Levi's Blue Jeans Orange Label Made in USA! The brown Levi's label is present on the waistband, as is the orange Levi's tab on the back pocket! The jeans are in used, but overall good, condition, with only a little fading and wear throughout. ALREADY BROKE IN AND READY TO WEAR. NORMAL WEAR ON THE HEMS, A HOLE IN RIGHT KNEE SEE PICTURES #3, #4 & #5. THE JEANS YOU SEE IS THE JEANS YOU WILL RECEIVE. SMALL TEAR ON BACK POCKET AND BELT LOOP SEE PICTURES #2 & #3. THE JEANS YOU SEE IS THE JEANS YOU WILL RECEIVE. The ACTUAL Size are 31x31. The ACTUAL Size are 37x31. They are in Excellent Condition, but there is a small stain on back of left leg. They are in Great Condition, although the leg hems have been purposely split on both sides!